Ruby Valley Trek is the ultimate trekking to the unique land of multiethnic people of Nepal. It’s nestled on the lap of beautiful Himalayas and nature. The journey is rich in its trail too as the trekkers can experience the diversity of the four different districts of Nepal. Bharal Adventure Pvt. Ltd. is always working towards achieving the sustainable tourism in Nepal. Therefore we present to our valued trekkers and clients this new trekking trail of Nepal. The journey of the spectacular Ruby Valley Trek starts from the Syaprubeshi of the Rasuwa district of Nepal passing by the Trishuli which is in Nuwakot district. The trail then follows the Tamang Heritage Trek Trail towards the village of Gatlang. 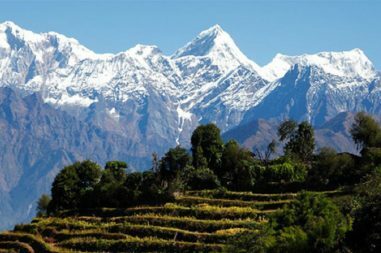 This trekking trail is actually located between the Langtang region and Manaslu region. Therefore the influence of the Langtang National Park and Manaslu Conservation Area is huge in these parts of the region. The glorious crossing of the Pangsang Pass takes you to the Tamang ethnic village of Tipling in the Dhading district of Nepal. The gorgeous view of the mountains, hilly terrains, waterfalls, forests and rivers will make your journey quite remarkable. The natural hot water springs is another highlight of this trekking. You can relax and rest in the calcium and phosphorous rich water for the revitalization of the skin, muscles, and soul too. Trekkers can enjoy the fishing or the celebration of the local festivals in the community as well if the calendar has the festivals during your trekking. 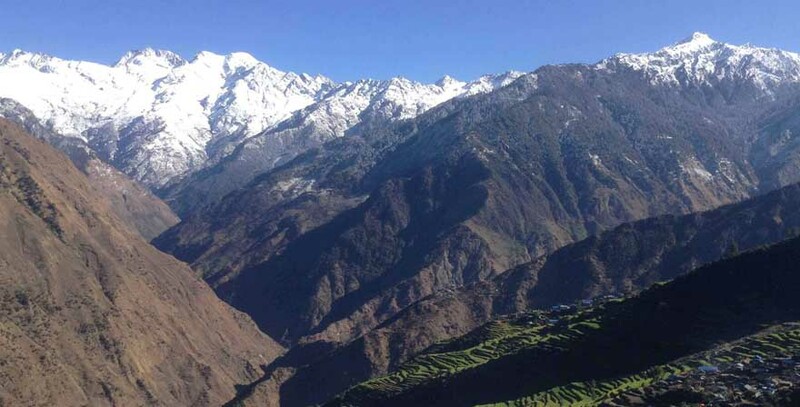 The villages like Shertung, Dharkha, and Kintang can be reached during this trekking. Bharal Adventure Pvt. Ltd. will be more than happy to take the trekkers towards its village. The trekking crew of the trekking agency is from the Dhading district. Therefore, before departing to Kathmandu you can stay on the houses of Bharal Adventure’s staff houses. Book the newly opened yet vibrant trekking trail package of Nepal. Ruby Valley Trek in the Ganesh Himal Region will be the best off the beaten trekking activity for you. After breakfast we will drive north from Kathmandu over zigzag and hilly road that passes through a busy market town of Trishuli Bazaar and Dhunche. We will continue our drive journey to reach Syabrubesi where there are many tea houses and good camping sites. Today’s drive offers good views of Manaslu, Ganesh Himal and Langtang Himalayan Ranges. Besides, you will get brief glimpses of village life along the drive route. We start our trek from Syabrubesi following the trail that leads through the new valley road to Chilime Khola valley. From there we will turn left and head west on a good trail towards Thambuchet and continue trekking until we arrive at Gatlang. Leaving Gatlang we will follow a broad trail that leads to Parvati Kunda. From there we will trek through forest filled with pine and rhododendron trees before climbing up to Khurpu Dada Pass at 3710 meters. From here we will turn west and descend all the way down to Somdang. From Somdang we will follow the trail that climbs up through dense forest before traversing above a large kharka that heads towards Pasang La Pass at 3842 meters where locals have built a small gompa. From the top we will gradually descend through terraced fields of Lawadun or the village of Tipling. There are few tea houses and good camping sites in Tipling. From Tipling we will descend to cross over Adha river and start to climb towards the village of Shertung. During the trek today we will have opportunity to look at the fertile river valleys. Shertung is a small village inhabited mainly by Tamang. From here good views of Lapsang Karpo and Ganesh Himal renge can be seen. We will trek for about 30 minutes to reach Chalish Gaon. Here we will leave our stuffs and take a walk to reach Tatopani which means hot water/spring. Enjoy your day at the hygenic hot spring in one of the best hot spring in this region. We will return to Chalish Gaon for the overnight stay. We will continue our trek form Chalish following the trail that passes through Mani Danda. From here great views of Ganesh Himal Range can be seen. Our further trek passes through Deul danda, Gobre village, Chhap danda and Bandari Bhir. Rock climbing has gained more popularity in recent years around this area. We will continue to trek following the trail that passes through Lishne jungle and Chhapchyat village and arrive at Jurlang. Leaving Jharlang we will gradually descend down to Jharlang Phedi while passing along terraced fields with stunning landscapes. Crossing over several suspension bridges we continue on the trail that leads to Darkha Gaon. People from different tribe communities reside in this village. We will follow the trail that descends all the way down to Darkha Phedi. From there we will take a local jeep and drive over the zigzag bumpy roads to arrive at Dhading Besi. During our drive from Darkha Phedi we will pass along villages of Kimtang Phedi, Katunje and Jyamrung. After arriving at Dhading Besi we will take another drive back to Kathmandu. Kathmandu – Syabrubensi and Darkha Phedi – Kathmandu by Public Bus or Jeep. National park permits and TIMS (Trekker’s Information Management System) card. Three meals (Breakfast, Lunch and Dinner) a day with tea/ coffee. One expert guide of Ruby valley ganesh himal trek local guide and required number of porters. 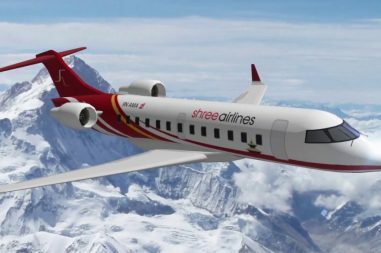 All expenses for Nepalese staffs, their insurance, equipment and salary. Seasonal fresh fruit such as Apple, Banana, Orange etc. All official expenses and 13% Government VAT.